Where is Nepal located on the World Map - Here is Nepal ! For people who just heard about Nepal often asks a question, “Where is Nepal or Where is Nepal located on the World Map ?”. So here we show you where exactly Nepal is located on the World Map and Google Map. Here is Nepal on the World Map landlocked in between two big countries of Asia, China and India. We have added a Google Map with the World Map so you can clearly find out where exactly Nepal is located in the World Map. In the world map just head to Asia and you will see the big map of China and India. There is locator in the map available here and you can zoom the map if you want and figure out the small country with an area of 147,181 square kilometers (56,827 sq mi) and a population of approximately 27 millions. Here we have presented the World Map where we have located Nepal. Simply compare this map with the Google map below and you will find it’s not much far to travel this beautiful country and experience lot of adventures. That was easy to locate Nepal on the World Map isn’t it ? This is Google’s World Map and the locator in the center is placed right on the location of Nepal. Similarly in Atlas or any Geographical books you can find our Nepal in the same location. For more clear vision you can Zoom the map. 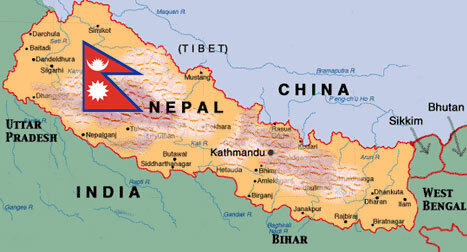 Do you want to know more about Nepal and where it is located? Well the main objective of this blog is to give you information about where is Nepal. Get more information and adventures in Nepal which you would love visiting Nepal.